This year Microsoft finally brought TechDays, its Canadian technical training conference, to Edmonton. Some of us had been asking Microsoft to add our city to the cross-Canada tour for a while, and when enough people spoke up, they listened. And it paid off too. 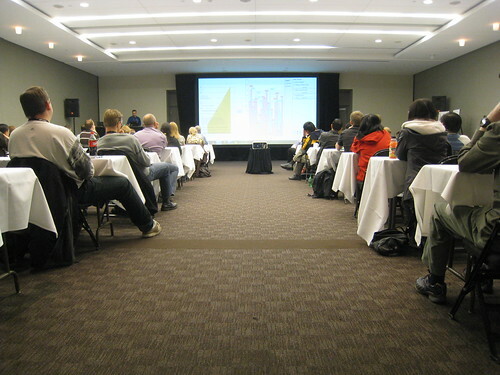 Initially Microsoft was expecting 250-300 people to register for the Edmonton event, but we blew that out of the water! Nearly 500 people registered! And judging by the large crowds, I’d say that most of those people attended too (it’s probably quite uncommon pay the registration fee and then not attend). There is always criticism of the sessions offered at TechDays, but I think they had a decent mix this time around. Lots of introductory stuff I suppose, but that seemed to match the makeup of the audience. The addition of the Local Flavours track was a good start toward including some more diverse content as well. I was the track host for the “Optimizing the Development Process” track, and I did two presentations of my own. I thought both talks went well, and I hope people found them useful! Given the success of the inaugural TechDays in Edmonton, I’m sure they’ll be back again next year. You can follow along as TechDays continues to travel across the country using #techdays_ca on Twitter. Joey wrote about Day 1 here, and you can see the rest of my photos here.